Steven Outram responds with feeling to the changing sky over the Gloucestershire countryside. His contemporary paintings show the extraordinary beauty of the British landscape. ''The Great Moon'' is a magical painting showing Outram''s countryside and tall old oak trees bathed in silver moonlight. 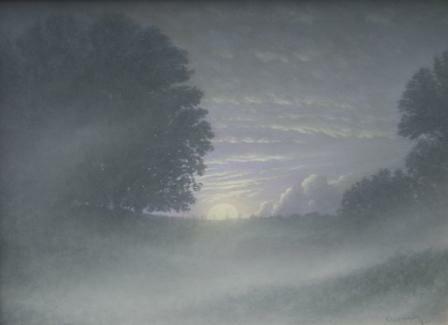 Mist and moonlight mingle and we get a sense of Steven Outram''s respect for the beauty and power of nature in this contemporary oil painting.